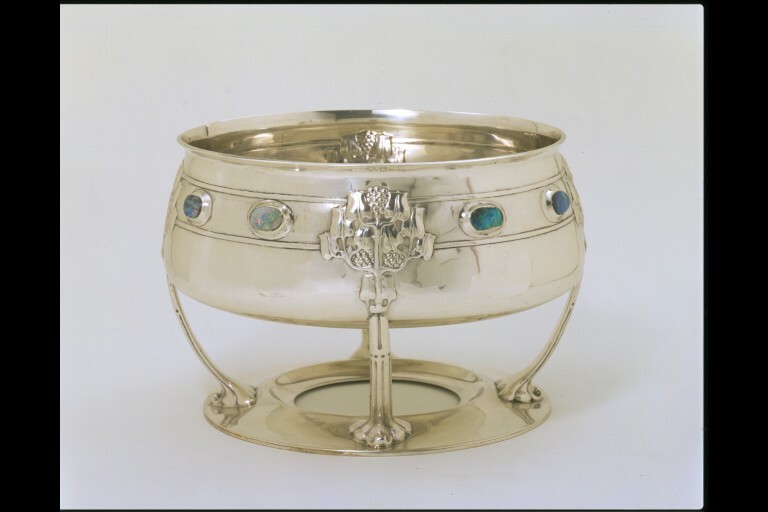 Bernard Cuzner (1877-1956) designed this silver bowl set with fiery South Australian opals. It was one of his best-known designs for Liberty & Co., the London department store Arthur Lasenby Liberty founded in 1875. He also repeated it with minor variations for private commissions. Cuzner supplied further designs for the Cymric silverware and jewellery range started by Liberty in 1899. 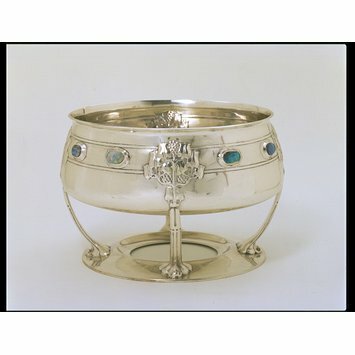 Circular bowl with convex sides and everted rim, supported by four, curved feet which rise from an annular ring. The opals (probably South Australian) in rub over settings and placed in a line below the rim and bordered above and below with a row of double, engraved lines. The feet terminate with the bowl in an embossed stylised leaf and join the annular ring in a small, stylised scroll. One of Cuzner's best known designs for Liberty and repeated with minor variations by him for private commissions. Cuzner trained at the Redditch School of Art, the Vittoria Street School of Jewellers and Silversmiths and Birmingham College of Art under R. Catterson-Smith and Arthur Gaskin. 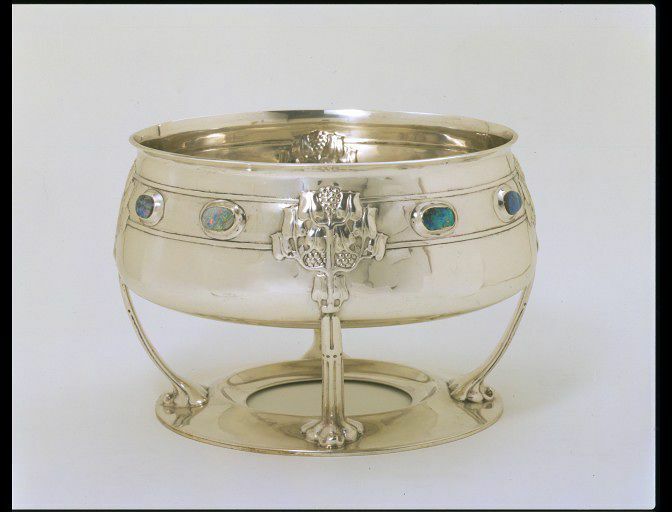 Silver set with opals, Birmingham hallmarks for 1904-5, mark of Liberty & Co., designed by Bernard Cuzner. Designed by Bernard Cuzner (1877-1956). One of Cuzner’s best known designs for Liberty and repeated with minor variations by him for private commissions. Cuzner trained at the Redditch School of Art, the Vittoria Street School of Jewellers and Silversmiths and Birmingham College of Art under R. Catterson-Smith and Arthur Gaskin.